When I was a child we lived in an old farmhouse with dark corridors leading to bedrooms rarely visited. 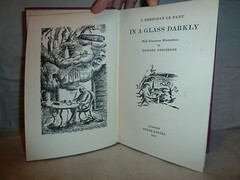 Having two older brothers it is not surprising that I was introduced to stories of ghosts and witches at an early age. The most terrifying room, however, was the sitting room, only used for social events, that lay at the far end of the house from the parlour, where we spent most of our time. Even on a warm summer day, I did not care to linger there. But the frisson of fear was never altogether unpleasant and it is to these apparently harmless childhood terrors that I attribute my love of ghost stories. The first ghost story I remember was read to us by our live-in land girl, one night when my brother and I had just been put to bed. 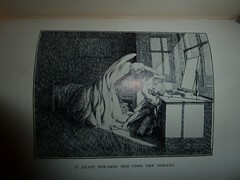 With hindsight, A E D Smith's 'The Coat', in which an old moth-eaten greatcoat, first seen hanging from a coat hook, attempts to strangle an unwary visitor to an uninhabited house with it's horribly flapping empty arms, may not seem the most suitable night-time reading for 6 year olds, but it is the only bed-time story from that period that I actually remember. Years later, I found the story again in 'The Mammoth Book of Thrillers, Ghosts and Mysteries', in a part of the book invitingly called 'Sealed Section'. The coat belonged to a disreputable person who had been shot when wearing it and now apparently waits in the house for those staple ghost story characters who know something's wrong but still persist in invoking any malevolent spirit in the area. 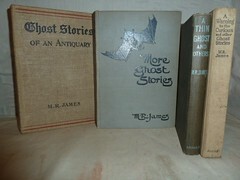 Since then there has rarely been a period of my reading life in which ghost stories have not been close at hand. At first it was through anthologies, such as the superb collection 'Fifty Years of Ghost Stories', in which I first read M R James and Sheridan Le Fanu, both of whose stories are just as fresh 50 years later. 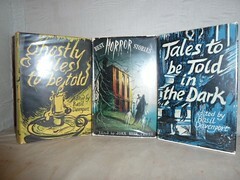 There were also the excellent Faber and Faber collections 'Best Horror Stories', with it's wonderful Felix Kelly dust wrapper, and 'Best Ghost Stories', followed by Basil Davenport's anthologies 'Ghostly Tales To Be Told' and 'Tales To Be Told In The Dark'. It was in these latter collections that I first read Arthur Machen. Once I had read the massive Wise and Fraser anthology 'Great Tales of Terror and the Supernatural' and Montague Summers' 'Supernatural Omnibus', I was in a position to sort out the great writers from the merely competent. I also began slowly to search out the original volumes by these authors from which their stories had been drawn by the anthologists. 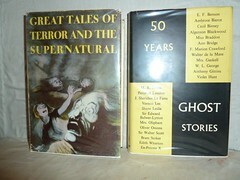 So, who are these great authors and what are the key books that constitute a ghost story collection? Most, myself included, would place M R James at the head of the list. 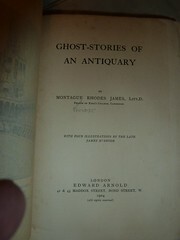 His four volumes 'Ghost Stories of an Antiquary', 'More Ghost Stories', 'A Thin Ghost and Others' and 'A Warning to the Curious and Other Ghost Stories' were published between 1904 and 1926 and define what has come to be known as the antiquarian or scholarly ghost story. Oblivious to warning signs that are blindingly obvious to the reader, M R James's typical hero, pursuing his antiquarian interests will insist on provoking the malevolent entity that will either finish him off in a particularly nasty way or guarantee him (and us) future nightmares and other unpleasant moments. As to what are the best stories from the 30 or so written by MRJ, strong claims may be made for 'Oh Whistle and I'll Come to You My Lad', from the first of the four volumes (published in 1904) and 'Casting the Runes', from the next volume (1911). I do have a particular fondness for the superbly titled 'The Tractate Middoth', from 'More Ghost Stories', partly because most of the action takes place in a library, which I assume to be the Fitzwilliam. It is the removal of the book of the title from the library that precipitates the rather nasty revenge taken on the borrower, when a 'little dark form' rises out of the shadow behind a tree trunk and two arms emerge to cover his face in a 'mass of blackness'. Those staple trappings of ghost stories, cobwebs and spiders, feature prominently in this story. 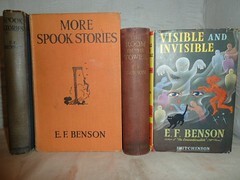 E F Benson, like M R James, produced four excellent volumes of ghost stories, beginning with 'The Room in the Tower' in 1912, followed by 'Visible and Invisible', 'Spook Stories' and 'More Spook Stories' (1934). Though variable in quality, there is much to enjoy here, my own favourites being 'The Face' and 'Pirates', both much anthologized. In the latter story, a middle-aged man purchases the house of his childhood, long deserted, and restores it to its former state when he and his brothers and sisters, now all dead, used to play in the garden. Living more and more in the past, he finally joins the phantom children in a game of Pirates and is found dead the next morning. The ghosts in this story are the ghosts of childhood; it is significant that the house had been re-furnished with much of it's original furniture, returned to the house after some 40 years. This re-creation of the past brings back the former inhabitants of the house. Or is it all down to an over-active imagination and a weak heart? 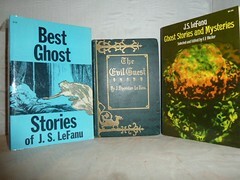 As with all the best ghost stories, there are several possible interpretations. Ghosts of children, or ghosts haunting children, are plentiful, from the vengeful children with the fearfully long finger-nails, who return to tear the heart out of the unfortunate Mr Abney, in M R James' 'Lost Hearts', to little Miles and Flora, corrupted by the ghosts of their former governess and her lover, in 'The Turn of the Screw', or again is the whole nightmare visited on the children by their paranoid new governess, the un-named young lady who narrates the story? It is time to introduce the third of the writers who, to me, define the English Ghost Story. This is, paradoxically, an Irishman, Joseph Sheridan Le Fanu, who, along with his admirer, James Joyce, is associated in my mind with Dublin in a way that no other city or writer is. Whenever in Dublin, I stand outside the house on Merrion Square from which Le Fanu emerged for his nocturnal walks round Dublin and in which he is supposed to have succumbed to his final nightmare. Walking the lonelier streets of Dublin, I listen for the following phantom footsteps that pursued Captain Barton to his terrifying end in 'The Familiar' and in a quieter section of Aungier Street, I observe a deserted house with grass and small trees growing from the roof that I would like to have been the setting for Le Fanu's short tale 'An Account of Some Strange Disturbances in Aungier Street'. This short topographical tour of Le Fanu's Dublin must end outside the much haunted 'House by the Churchyard' in Chapelizod, the setting for the Le Fanu novel so admired by James Joyce and one of the influences on his 'book of the dark', 'Finnegans Wake'. "It was long before the terror of recent events subsided; and to this hour the image of Carmilla returns to memory with ambiguous alternations- sometimes the playful, languid, beautiful girl; sometimes the writhing fiend I saw in the ruined church; and often from a reverie I have started, fancying I heard the light step of Carmilla at the drawing-room door"
To my mind the last phrase of this sentence captures the essence of the ghost story; it is in our unguarded moments that the phantoms of our own past as well of those of literature return to surprise us and, I sincerely hope, cause us not a few unpleasant moments. I will end this all too brief survey with a personal selection - eleven of my favourite ghost stories, restricted to one per author. These are given in chronological order of publication. If not one of these stories makes you unwilling to look back as you turn the lights off when leaving an empty room on a dark night as the wind moans in the trees, then maybe ghost stories are not for you. It has often been said that the ghosts of the nineteenth and early twentieth century did not survive in the era of electric lights and motor cars. This is only partly true; there are many modern writers who have maintained the traditions of the 'Golden Age' of the ghost story. In a later blog, I will turn my attention to some of these later practitioners of the art. Wow! I love this collection. I'd love to have all these wonderful edition.